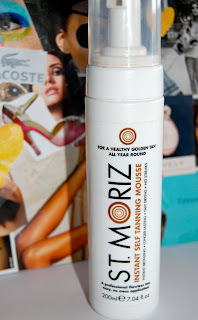 This is just a quick review of St Moriz Instant Self Tanning Mousse which Katherine kindly picked up and posted to me. Admittedly I am a novice at fake tan and up until one month ago I was a fake tan snob. Growing up the girls at school "The Plastics" as we called them, use to cake themselves in awful fake tan. I put me off ever trying it, as I did not want to look like a tangerine. After hearing about this fake tan through Lisaz09 on youtube I decided to give it a go. I am now in love with St Moriz. It is known as the Dupe for St Tropez containing identical ingredients and an almost identical formula. Therefore its a great 'credit crunch' option for those who need to save the pennies. The Colour is a lovely golden brown... not orange... therefore looks a lot more natural than some fake tans. The Smell is not strong at all. To me it smells a little like everyday soap. The Application is easy. The mousse formula is easy worked into the skin without dripping creating a streak free finish even when applied by a novice. The End Result is lovely. I recommend if you are pale applying a thin layer of tan in order to keep it natural looking. The Downside is it can make some people breakout on their face. It hasn't yet to me but if it does... it is still a great option for your body, or just you legs. Tip: (From Lollipop26) Do a section of your body at a time, washing your hands in between each one to prevent the need for gloves. I purchased this for £2 at home bargains (Katherine paid for the postage and sent it to me...THANK YOU) It can also be purchased at http://www.fragrancedirect.co.uk and some TK Maxx. @Connie My friend ordered her St Moriz from there and she didnt have any problems but I cant say from first hand experience.